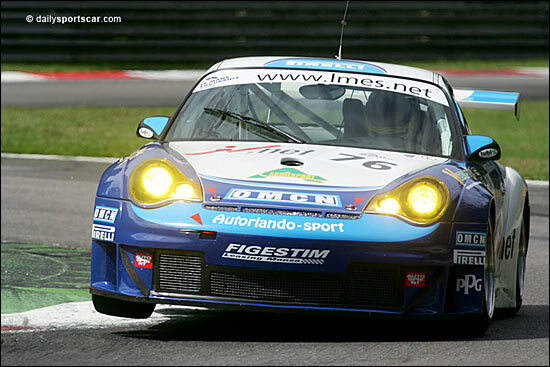 Marc Lieb – 2005 LMES GT2 Champion, 2005 Le Mans winner, 2005 FIA GT2 Champion – will be driving an Autorlando Porsche in the Le Mans Series this year. “The Autorlando team always showed good speed last year together with Mike (Rockenfeller) and the Pirelli tyres,” comments Marc Lieb. 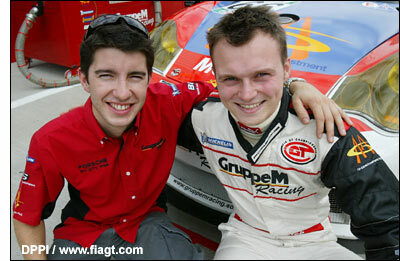 “I hope we can start from there, and we’ll work hard to improve the whole package.” The image on the right shows the 2005 (GruppeM FIA GT) partners, once they were crowned as Champions. Marc Lieb is expecting some fierce competition in the LMS this season. “I really don't know who my team-mate is for the moment,” concludes Marc Lieb. We believe it could be Joel Camathias. Autorlando seems likely to enter two Porsches in the Le Mans Series this year, the team having purchased the former Embassy RSR over the winter. Here's the Autorlando Porsche at Monza last year, where Mike Rockenfeller put it on pole in GT2, then roared away to a huge lead early on.